While it’s not easy to find quality Tex-Mex cuisine in the Triangle, you don’t have to drive far if you know where to go. 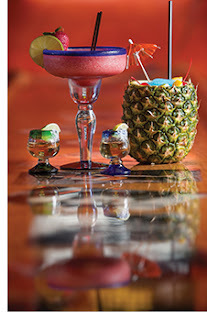 Discover what others have already found: culinary enchantment at Bravo's Mexican Grill in Cary. This 28-table outpost serves up first-rate Tex-Mex provisions amid cheery surroundings. 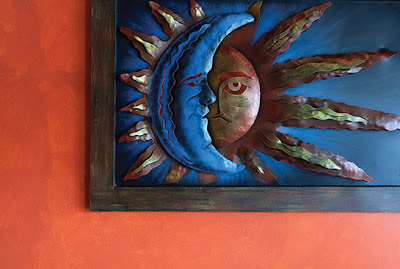 A pervasive sun and moon theme adorns the vibrant, multi-hued dining room walls. Stylish pendant lights hang above the cozy bar area, which showcases inlaid photos from various classic Western films. It’s definitely the type of place where you’ll want to linger for a long while. What sets the restaurant apart from other Tex-Mex establishments is an affordable and diverse menu featuring a variety of seafood, beef, chicken and pork selections. Vegetarians will also find plenty of options, such as the veggie de la casa with bell peppers, beans, mushrooms, squash, onions and cheese or the unpretentious cheese quesadillas. Appetizers like stuffed jalapeños and Texas dip with shrimp, beef and chicken pack a bold flavor punch. The substantial Bravo’s Sampler features beef nachos, chicken quesadillas and chicken flautas. If you’re in the mood for soup, consider the hearty caldo de pollo, a special broth with chicken breast, rice, pico de gallo, tortilla strips and avocado. At lunchtime, you’ll find the requisite fajitas, chimichangas and taco salad, while nearly a dozen inexpensive specials also vie for consideration. Hard shell or soft taco options range from ground beef and shredded chicken to shrimp and marinated pork, but the house-favorite fish tacos are an absolute must. 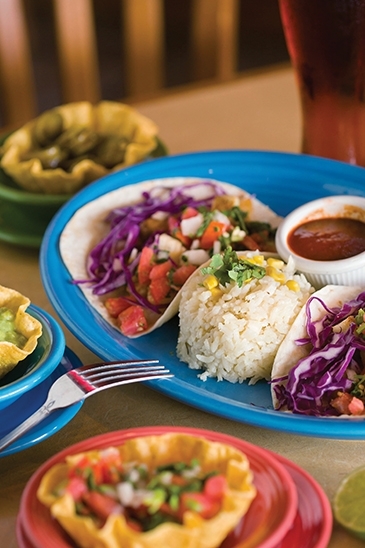 Two soft tortillas contain chunks of fried or grilled tilapia, cabbage and fresh pico de gallo. If you prefer more familiar Mexican fare, the make-your-own combo meals feature beef or chicken enchiladas, burritos and tostadas, among several other choices. All combination dinners are served with rice and beans. Attractive daily dinner specials provide even more reasons to visit Bravo’s. Whether it’s $2 off fajitas on Mondays, $1.25 hard tacos on Wednesdays or the discounted Bravo’s Sampler on Saturdays, there’s always a good deal to enjoy. Be sure to save room for dessert. Among the alluring sweet concoctions are sopapillas, burrito banana and authentic flan. Fried ice cream also is a popular staple on the dessert menu. When it comes to drinks, Bravo’s offers two dozen varieties of beer, including Mexican favorites Modelo Especial, Sol and Corona. The most popular beverages are the paradise drinks, also known as Bravo’s Coladas. Five different flavors — peach, mango, watermelon, piña colada and strawberry — are infused with tequila or rum and then served inside a pineapple shell. Service at Bravo’s is focused and pleasant. Without question, attention to detail is a factor that makes it worth visiting time and again. This reminded me of the mexican grill I went to in a hotel near buckingham palace. The nachos were just to die for and the spice is right...and yes, the price, too. Life Café: Who Says Healthy Isn’t Tasty?